Immerse yourself in the cultural history of South Louisiana as you experience a bygone era, complete with opulent plantations and man eating swamps. 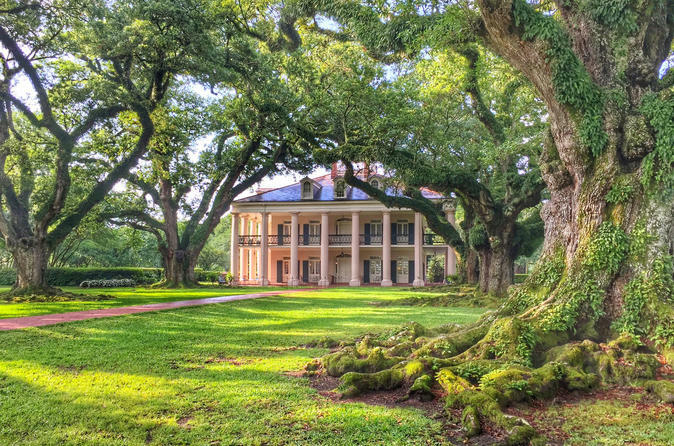 This action packed day excursion includes guided tours of Oak Alley and Laura Plantations, a delicious country brunch, and a swamp cruise deep into Cajun country, home to the legend of “Rougarou”, the Cajun werewolf. On the grounds of Oak Alley, enjoy a sumptuous Plantation Country Brunch featuring Crawfish Etouffee, Chicken & Smoked Sausage Gumbo, Oeuf du Jour (egg dish of the day), Cajun Smoked Sausage Links, fresh fruit and yogurt, and other offerings. Before brunch, tour the Big House and walk the grounds for a few minutes in one of the South’s most beautiful settings. Perhaps the most photographed plantation ever, Oak Alley has been the setting for such motion pictures as Interview with a Vampire, Primary Colors, and the wedding of Bo and Hope from the daytime soap opera, Days of our Lives. A few minutes down River Road, enter the world of Creole Louisiana and experience what has been called “the best history tour in the U.S.” as you visit Laura Plantation. This tour is based upon 5,000 pages of documents found in the French National Archives and upon Laura’s "Memories of the Old Plantation Home," in which she details 250 years of true-life stories of the Creole women, slaves and children who lived and worked here. Then it’s a short ride to the Manchac Swamp where you will cruise through a privately-owned wildlife refuge, home to the legend of “Rougarou”, the Cajun werewolf. You might not find the “Rougarou”, but you’ll get up close and personal with some alligators in an area where time seems to stand still.